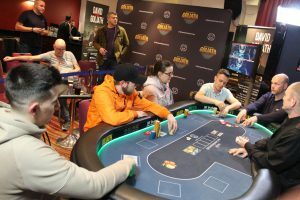 The biggest ever GUKPT Main Event in Scotland is now firmly in the history books! An unbelievable turnout of 309 entries is a new record by 51 entries! A massive credit has to go to Ant and his team for qualifying 67 players to the main event. That’s why this leg is one of the most fun because there’s plenty of locals in the field. The last two days have been dominated by eventual winner Nathan Slater who has held the chip lead since yesterday evening, he is a thoroughly deserving champion! After chopping the Blackpool Deepstack & finishing 5th in the Blackpool 25/25 Series, he now has a Main Event title, trophy and £42,110!! Thanks to everyone who interacted with us and watched the stream over the last four days, it’s been great fun. 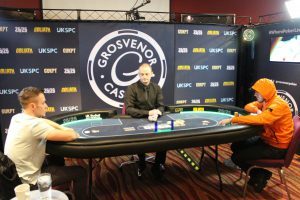 We will be back live streaming the UKSPC in just two weeks time, so join us then! Until next time, be lucky! 10th – £2,420 – M.I. Ace high is good for Nathan to take the final pot of the tournament! 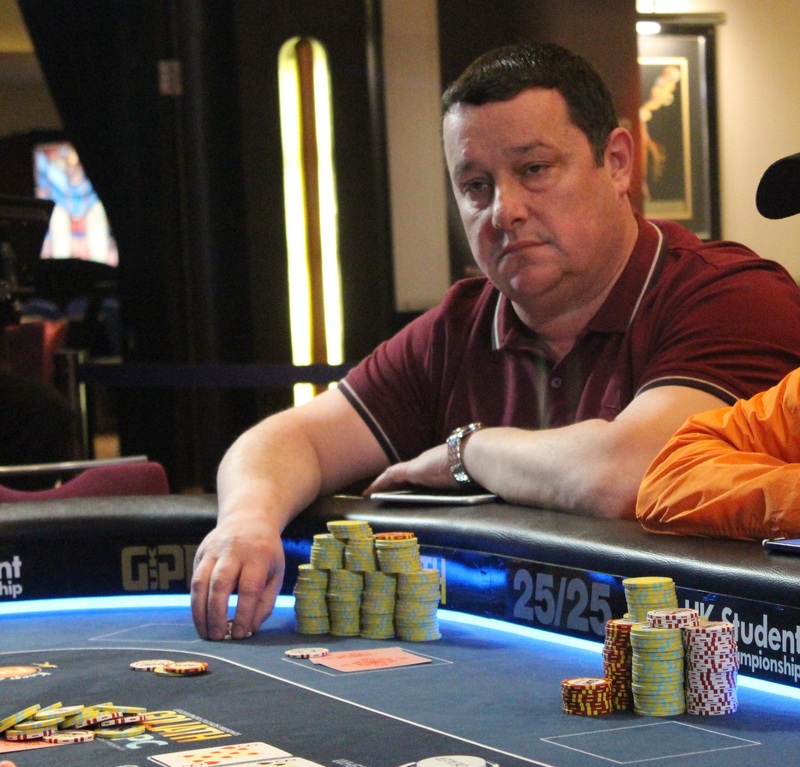 We lose Michael Kane in 2nd place for £27,860. 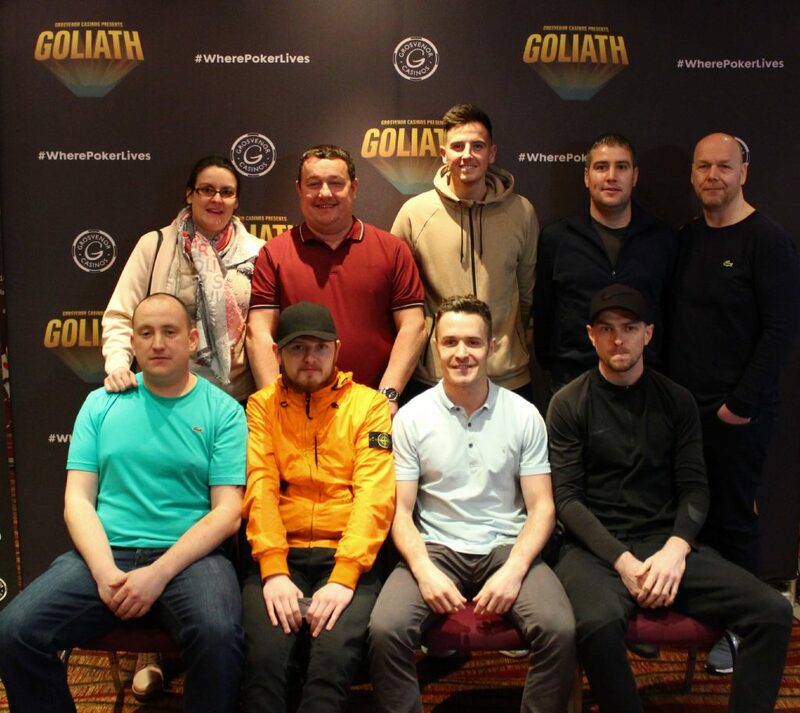 Nathan Slater is the GUKPT Edinburgh Main Event 2019 Champion winning £42,110!! Michelle ships all in for 600k and is called by Michael Kane. Michelle tables A-2 and is against the A-10 of Michael. No two on the board and we lose Michelle in 3rd place for £17,110. Michael Kane shoves the small blind and is called by William Hanratty in the big blind, putting himself at risk for his 5 bigs. Michael rivers two pair to take the pot and now has 1.3million. 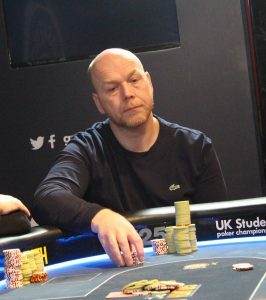 We lose William Hanratty in 4th place for £10,900. The blinds increase to 30k/60k with a 30k ante. Steven Macleod moves all in for his 600k stack and is called by Nathan Slater. Steven tables QUEENS and is in good shape for a double up against the A-Q of Nathan. The flop comes ACES high! No one outer for Steven and he finishes in 5th place for £7,420. The players are back seated as we begin level 27. The blinds are now 25,000/50,000 with a 25k ante. The players have decided to take a break. This has been a very uneventful session so far. There’s been no hands to speak of in the last 40 minutes of play. The side event is booming though with 80+ entries! The players are back seated as we level number 25. The blinds are 15,000/30,000 with a 15k ante. 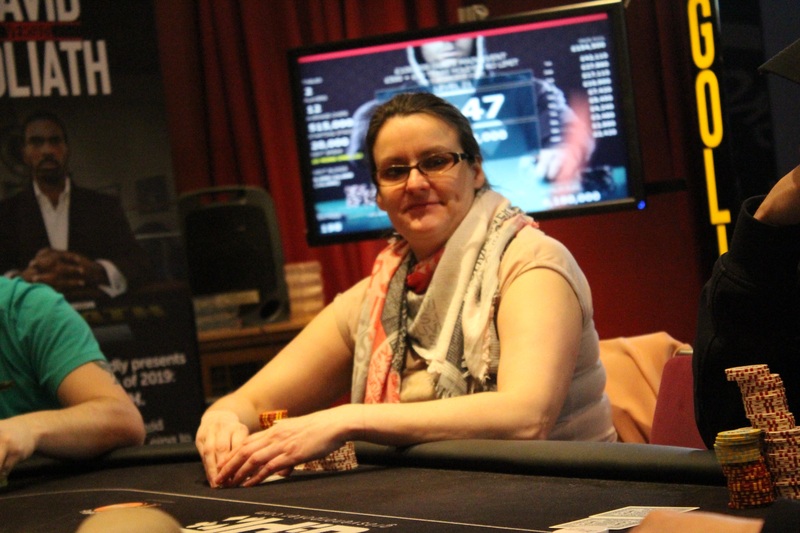 Jamie Whyte three bet shoves his 8 bigs stack and is called by Michelle Baldie. Pocket eights for Jamie but he has ran into the QUEENS of Michelle. Queens hold as Michelle increases her stack to 800,000. Jamie heads out in 6th place for £5,450. James Gray moves his short stack all in and is called by Steve Macleod. No help for Jambo and we lose him in 7th place for £4,260. The blinds increase as we begin level number 24. They are now 12,000/24,000 with a 24k bb ante. 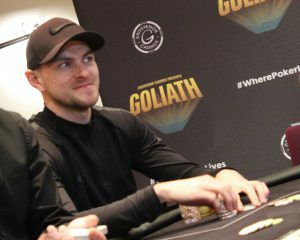 Jamie Geraghty all in for 300,000 with pocket Kings against the pocket jacks of Michael Kane. The board runs out !!! Michael rivers a two outer to take the pot from Jamie, Michael now has just short of a million chips. 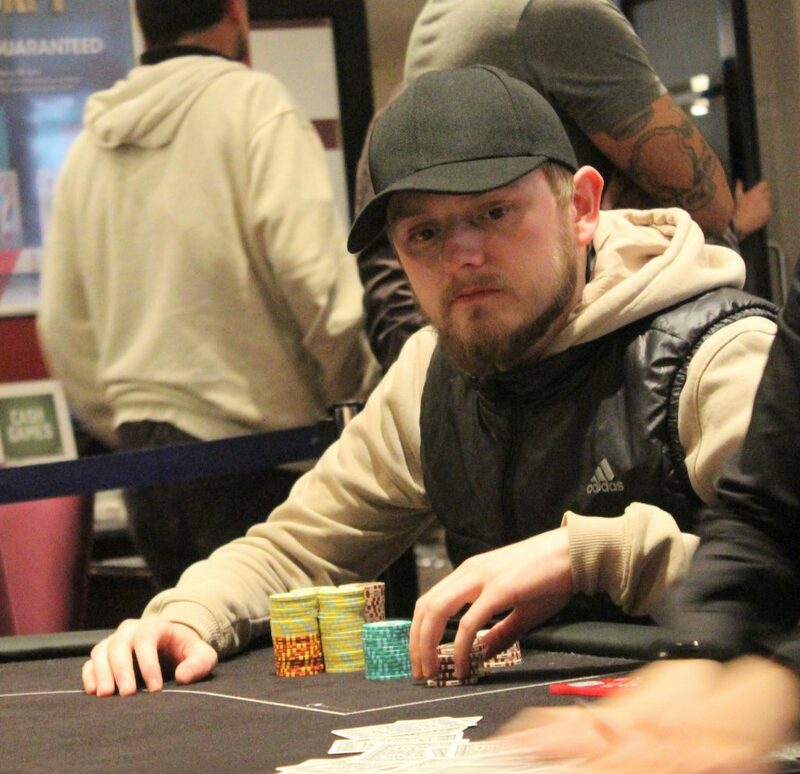 We lose Jamie Geraghty in 8th place for £3,480. 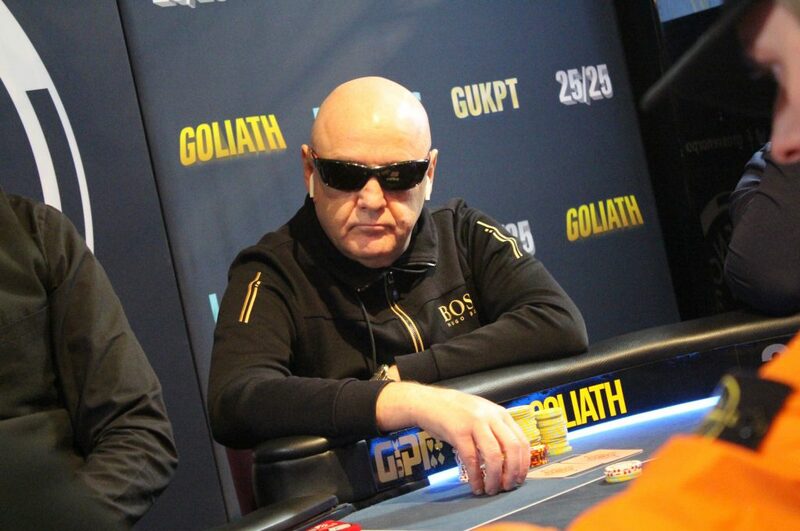 Bernie McGinlay gets it all in holding A-Q and runs into the QUEENS of Nathan Slater. Queens hold for Nathan and Bernie heads out in 9th place for £2,880. Nathan is now up to 2.7million! M.I busts to Michelle Baldie, which means we are now on a final table. The players are now on a break before beginning the final table. Mick Fletcher three bet shoves his nine bigs stack over an open from Nathan Slater. No dramas and we lose Mick Fletcher in 11th for £2,120. The players are back seated as we begin level number 23. The blinds are now 10,000/20,000 with a 20k bb ante. Nathan bets big on the river, Davie shoves and Nathan snaps and tables the nut flush!! Davie has the second nuts, but heads out in 12th place for £1,970. Bernie McGinlay gets it all in with against the of Michelle Baldie, Michelle manages to find an ace on the river to double up to 450,000. The very next hand Bernie gets his 100k all in with against the of M.I. Bernie flops a seven which is good for a double up to 235,000. He doesn’t slow down moving all in again and being called by M.I. It’s a flip as Bernie tables against the of M.I. Bernie doubles again and is now back in the game with over 500k M.I is crippled down to 140,000. The blinds increase as we begin level number 22. They are now 8,000/16,000 with a 16k bb ante. The average stack is 45 big blinds so the tournament is super deep! There’s been no action to speak of in the first 20 minutes of play. The blinds are starting at 6,000/12,000 with a 12,000 ante. Good morning and welcome back to Day 3 for the final day of GUKPT Edinburgh. Of the 309 entries there are just 12 players coming back today, they are guaranteed £1,970 but their eyes will be on the first place prize of £42,110!! We’ve got a great mix of players for the final day and it is going to be a cracker! Play begins at 12pm today, with the live stream starting at 12:30pm.